Dr Oscar Ubaldo Peñalba Suarez was born in Tandil, Argentina where he studied Medicine at the National University of La Plata. He began his training as a specialist in Orthopaedic Surgery and Traumatology at the Dexeus University Institute of Barcelona (Catalan Institute of Traumatology and Sports Medicine). He obtained the title of specialist doctor in Orthopaedic Surgery and Traumatology in Spain and Argentina. His professional career has been closely tied to sport, due to his activity and relationships as a high-competition athlete (member of Argentina’s national team of athletics). His initial work took place on the ski slopes in the Pyrenees and in hospitals whose main activity was Sports Traumatology, and he was also part of the trauma team that covered the Palau Sant Jordi arena during the 1992 Olympics in Barcelona. 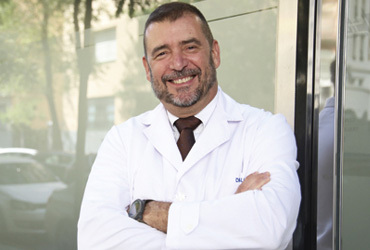 Some of his noteworthy achievements include his work done to promote the speciality during the period in which he acted as Medical Director of the Trauma Centre of Zafra (monographic clinic of Orthopaedic Surgery and Traumatology, based in Zafra), as Head of the Orthopaedic Surgery and Traumatology Department of the “Vía de La Plata” clinic in Zafra, and as Head of the Orthopaedic Surgery and Traumatology Department of the Llerena-Zafra Hospital Complex (Extremadura Health Service). He currently combines his work as the Director of Solcot with his work as Director of the Orthopaedic Surgery and Traumatology Unit at the Clinic Santa Elena in Madrid, where 100% of the activity in the capital is centralised. He also directs the Department of Orthopaedic Surgery and Traumatology at the Recoletas Hospital in Cuenca. He has participated and cooperated on a multitude of courses, lectures, seminars and conferences, sharing both knowledge and new techniques, nationally and internationally.